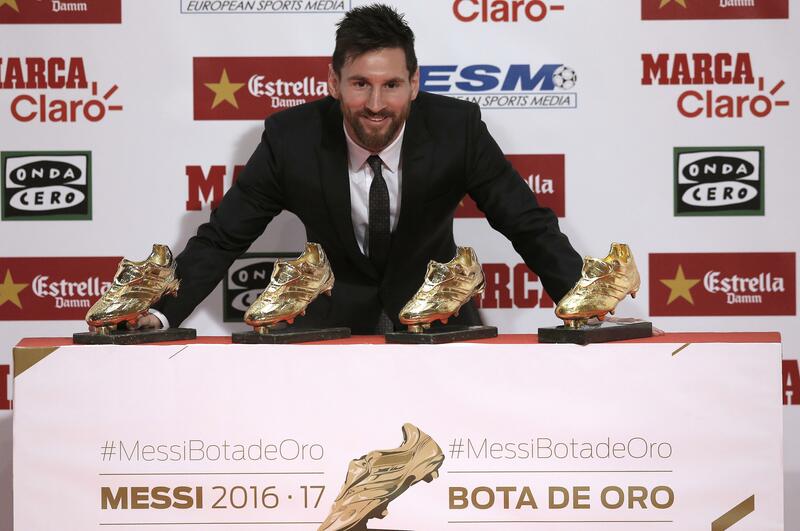 BARCELONA, Spain – Lionel Messi received his fourth Golden Shoe award on Friday for leading all of Europe’s leagues in scoring last season. It was the fourth time the Barcelona forward has received the honor, drawing him even with Real Madrid rival Cristiano Ronaldo as the record-holders for the award. Messi scored 37 goals in the Spanish league last season. The Argentina forward beat out Dutch striker Bas Dost, who netted 34 times for Sporting Lisbon in the Portuguese league. The 30-year-old Messi also led Europe’s league in scoring in 2009-10 (34 goals), 2022-12 (50 goals) and 2012-13 (46 goals). Messi was presented with the trophy by teammate Luis Suarez, who won the award in 2015-16 with 40 goals. Andres Iniesta and Sergio Busquets also attended the ceremony in Barcelona. Messi, Ronaldo and Suarez have divvied up the prize for the past nine years. The only time a non-Spanish league player won the Golden Shoe in the last decade was when Suarez shared the prize with Ronaldo while playing for Liverpool in 2013-14. The Golden Shoe is awarded by European Sports Media, an association of European sports newspaper and magazines. Published: Nov. 25, 2017, 12:17 a.m.